Stocks were slightly mixed on Friday after the January employment report came in better than expected. Three of the indices moved higher while the Nasdaq fell 0.25% on the day. The Dow led with a gain of 0.26% and it was followed by the Russell with a gain of 0.18%. The S&P tacked on 0.09%. Six of the 10 main sectors gained ground on Friday and they were led by the energy sector which gained 1.74%. The second best performance came from the tech sector at 0.59%. On the down side, the consumer discretionary sector was by far the worst performer with a loss of 1.46%. The second worst performer was the utilities sector with a loss of 0.38%. My scans continued their run of bearishly skewed readings with 26 names on the bearish list and four on the bullish list. The stretch of bearishly skewed results has now reached 17 days. The barometer changed very little with a reading of -30.4 on Friday. Thursday’s reading was at -32. I didn’t find a single stock that I liked for a bullish or bearish trade idea from the two lists on Friday. However, while doing other research I found a bullish trade idea that I liked. F5 Networks (Nasdaq: FFIV) scores an 86 on the EPS rating and an A in the SMR category. 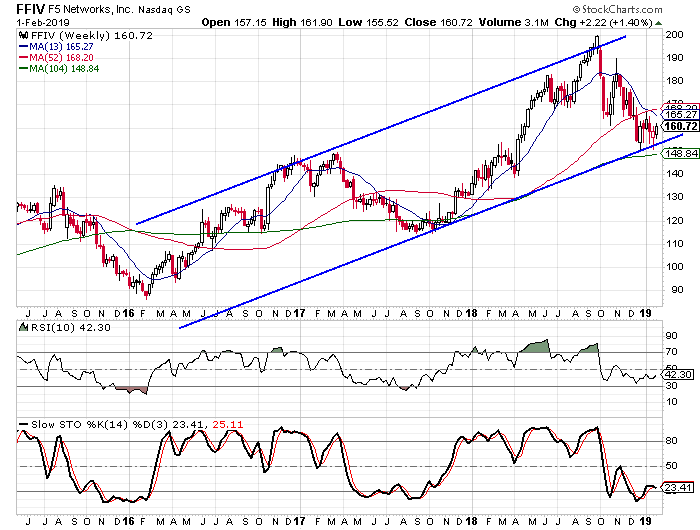 We see on the weekly chart that FFIV has formed an upwardly sloped trend channel and recently hit the lower rail. We see that the oscillators are close to oversold levels, but not quite there. I expect the stock to move higher in the coming months and this is a longer term trade than usual. Buy to open the April $160-strike puts on FFIV at $9.00 or better. These options expire on April 18. The options will double if the stock reaches $178. That is short of the upper rail of the channel, but above the 13-week and 52-week moving averages. I suggest a target gain of 100% and a stop loss at $150.50.